The Golden Globe Awards kicked off award season on Sunday, January 7th. For fashion enthusiasts, this time of year signals the chance to witness A-list stars wearing coveted fashion from the world’s biggest designers. But this year, the red carpet was completely redefined by a protest that united celebrities against a hot button issue that dominated media throughout 2017. 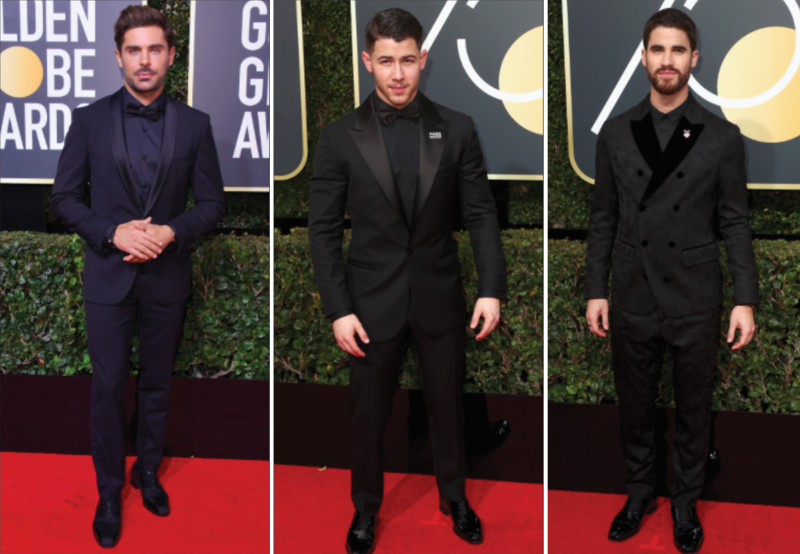 While some of the season’s biggest trends walked the carpet, there was one trend in particular that set the tone for the evening: black suits and gowns. Together, their solidarity sent one important message worldwide: #TimesUp for sexual abuse to be swept under the rug (or in this case, carpet). Some of the biggest stars of the night wore sleek dresses that featured sharp, clean lines and origami-like definition. Reese Witherspoon donned a classic old-Hollywood glam look with a one-sided oversized collar for a modern touch, while Tracee Ellis Ross upped the ante with a gorgeously regal head wrap. Sheer skin-bearing gowns have been a big hit on the red carpet among major stars for a few years now. While skin is usually the wow factor of sheer gowns we’ve seen in the past, these ladies all wore refined variations of the trend that focused more dimension, glitz, and volume. Angelina Jolie’s sheer, feathered bell sleeves were a favorite of the evening. While a mermaid gown is always gorgeous, theres nothing quite like a poofy princess gown. 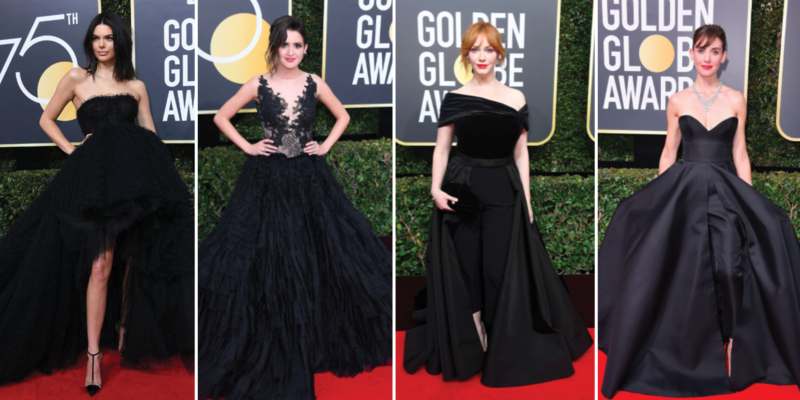 These ladies reemerged Cinderella’s gown in all black, and it just works. The simplicity of these gowns paired with these full, luxurious skirts were definite conversation-starters this year. Women didn’t stand in solidarity alone at this momentous award season. At this year’s Golden Globes, men faced the challenge of making a red carpet staple stand out. But they lived up to the heightened standard for the evening in elegant black power suits that caught major eyes.